IEMA Environmental Sustainability Skills for Managers include something that is core to environment management and put all the pieces of business sustainability in place as required by an organization or industry. 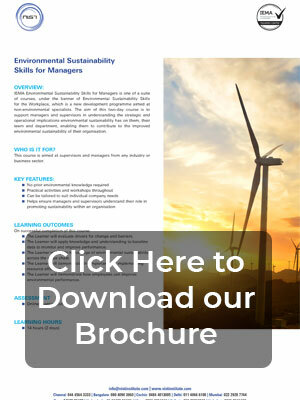 This course will definitely broaden the skill of managing environment by using the resources optimally. The great thing about this course is that, it is very engaging and highly effective to evaluate the drivers of change in environment and improve performance. Wants to be at the top level of management ladder, this course has the edge to be so and keep flow the income stream at steady rate. This course is specially designed for managers and supervisors to ensure environmental sustainability across the supply chain, their team and department. Being an interactive course, it describes environmental sustainability and environmental management concepts with relevant case studies and practical workshops. This will enable managers and supervisors contribute for the enhanced environment sustainability at all levels in their organisations. By pursuing this course, one can help their organization in managing the resources effectively and conforming to environmental laws, regulations, and standards.